Commercial Window Cleaning in Sydney, especially High Rise Window Cleaning, has undergone an extensive transformation. In recent years as the dependence on expensive scaffolding, costly maintain BMUs (Building Maintenance Units) and mechanical boom lifts are changing. We can see the large amount in increasing numbers of rope access alternatives. After more than a decade’s work in the field, a long list of satisfied repeat customers and a pedigree that includes commercial window cleaning of some of Sydney’s tallest high rises. Prorax has quickly established itself as a key player in this innovation. Dirty windows might be an unavoidable fact of life in Sydney, but high rise cleaning doesn’t need to be costly and intrusive. Rope access window cleaning allows technicians to get to difficult locations quickly and safely. Also with little impact on the environment they work in. By extension, rope access high rise window cleaning is cheaper, less dangerous (to both the workers and those around them) and avoids the potential multifunction for mechanical alternatives to damage building surfaces. 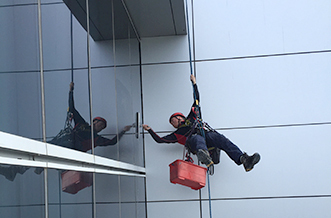 While rope access window cleaning offers many advantages, we also specialise in BMU commercial window cleaning. Whether your building is commercial or residential, you can rely on Prorax. Our employees are very experienced BMU drivers and will achieve the highest quality window cleaning results. We never compromise on safety alongside with correct procedures and outstanding service. We don’t specialise just for high rise window cleaning. Our service includes low rise buildings. Our high wash water fed poles can reach up to four storeys (approximately 20 metres). This Reach and Wash (water-fed pole) system is great especially for buildings without roof anchor points. All water running through our Water-fed pole systems are purified by special filters. That’s mean removing all minerals and calcium from the water. The result is streak free glass for your windows, glass roofs, skylights, signs, atria and canopies. For sparkling results (as advertisers like to say), look no further than Prorax. Like to know more about our high rise cleaning services in Sydney? Contact us today on 1800 040 117 for a quote or more information.